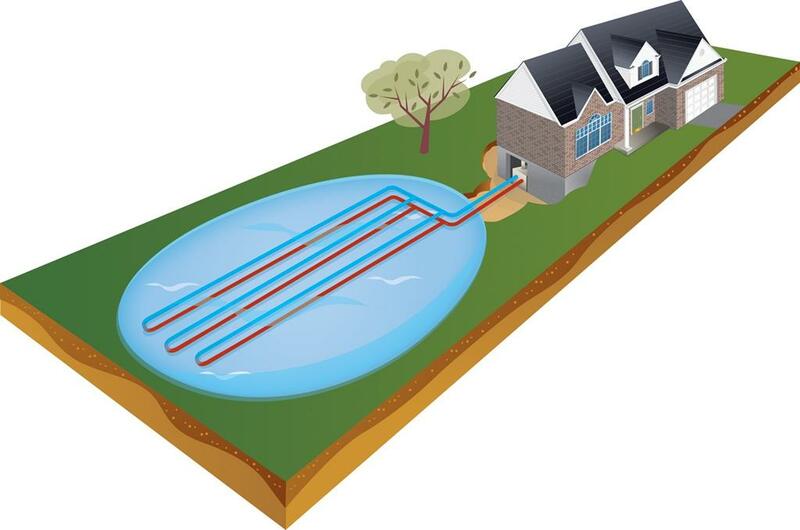 Geothermal loops can come in many configurations; the three most common are horizontal, vertical and lake or pond loops. The design details of your home will determine the size of the loop. Northern Greeen Energy will do a complete heat loss calculation and assessment to determine your heating load requirements. Once the pipes have been installed and backfilled, there is nothing outside. Traditional air conditioners can be big, loud, awkward, and unsightly. With a geothermal unit there is no need for an outdoor unit. The same indoor unit is used for cooling. For information on how the cooling cyle works click here. This type of installation is great if your property has land available to use. This is the most common type of installation in our area. Less excavation means less installation costs. This type of istallation is common in an urban settting where land availablity is limited. Drilling typically costs more however home owners are still going this route and are still saving. 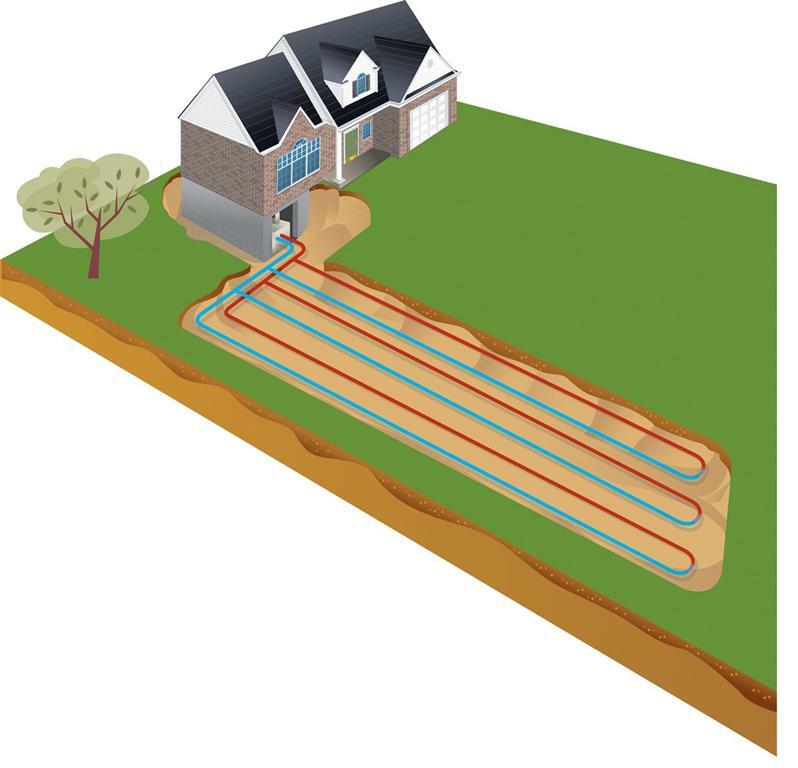 The underground loops connect to the main geothermal unit installed in your house, and is connected to your home's forced air (or water radiator) system. Compatible with your home's distribution system. As you can see the units vary in size depending on the distribution type. It is very important to find the right contractor with all of the credentials; such as Northern Green Energy Solutions, to have the system designed and installed properly. The contractor must be accredited by the CGC to design &install the systems and certified to do a full heat loss calculation on your structure. The contractor must also be certified in the techniques of fusing the high density polyethylene pipe to make sure the connections do not leak or restrict flow. All HDPE must be fused and not have any mechanical connections if it is to be buried in the ground or sunk in a pond or lake. If the contractor is to design your full heating system, they must also be certified in air system design and/or hydronic(s) design. It is also very important yet sometimes overlooked to have the proper equipment and materials in the system. Most of the parts in the system have to meet certain standards set out by the CSA and other governing bodies of the industry. The heat pump must be ETL or UL Listed, Energy Star Compliant, and CSA Approved. The pipe and fittings must meet CSA Standards and ASTM Standards. The pipe part of the system is where some companies use products that are not certified for a geothermal system by CSA Standards and therefore make the system ineligible for the government grants. The pipe must be marked in accordance with CSA Standard B137.1 indicating the intended service as "Geothermal" and "CSA 448" and not carry the word "potable" or the letters "P" or "PW". The pipe must also be made of a resin compound with the designation of PE 3048 and meet the cell classification of 345564C or 345434C as specified by ASTM Standard D3350. The "C" in the classification refers to the colour and UV stabilizer which according to the Standard Specification for Polyethylene Plastics Pipe and Fittings Material by ASTM, means that the pipe must be black in colour with a 2% minimum carbon black. It should also be noted that different resin compounds should not be fused together (PE3048 and PE1404). Our best advice is to do your research on the equipment and materials being installed for your system and make sure they meet the standards to protect yourself and your investment.